Carolina Nitsch is pleased to present IN AND AROUND THE HOUSE, the first comprehensive survey of Laurie Simmons’ early black and white photographs from 1976-78 at her Project Room in Chelsea, New York. This seminal body of work put Simmons at the forefront of a new generation of artists, predominantly women, whose photographic works began a new dialogue in contemporary art. 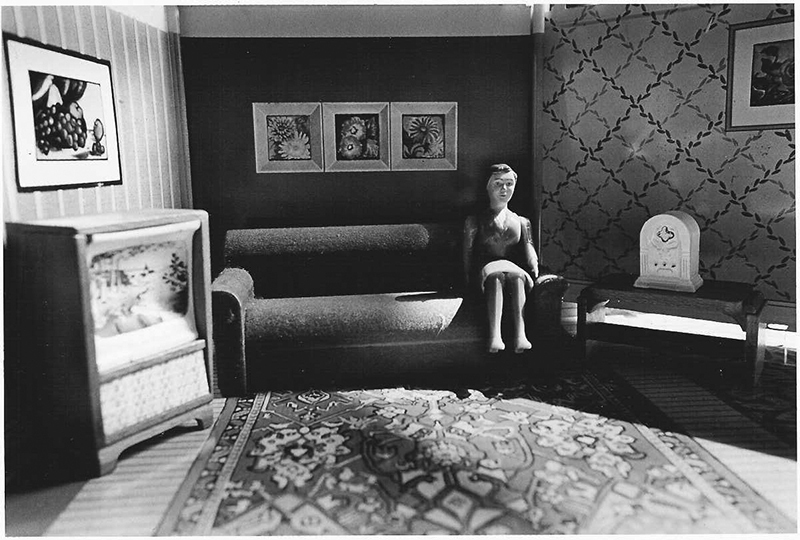 The use of set-up photography combined with the notion of child play – the images were shot in the rooms and before the facades of disassembled dollhouses – enabled Simmons to control perception and make reference to both general stereotypes and her own personal memories. As she arranged and rearranged the small vignettes, consisting of female dolls, dollhouse furnishings, miniature props and postcards, she was in her own words “… looking for the way your memory white-washes the image when you think about something from the past - making it far more perfect”. 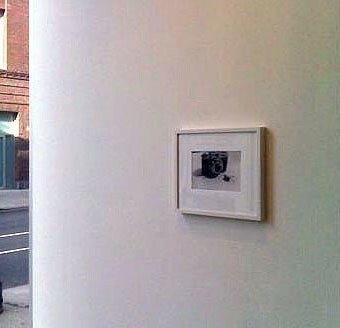 Simmons, while sharing strategies with the artists known as the Pictures Generation – Cindy Sherman, Richard Prince, Louise Lawler and Sarah Charlesworth – and their documentation and appropriation of cultural memory, forged her own identity more closely aligned with surrealism and artists such as Man Ray, Rodchenko, Bellmer and Gordon Matta Clark’s mysterious black and white photograph collages that documented his 1970’s “building cuts”. Simmons’ use and manipulation of dolls and interiors, marked by intentional dislocations and unexpected conjunctions, created a nonlinear narrative and abstract pictorial plane that echoes the skewed images of personal memory and dreams. Her subjects, which swell with a faux-tone of a simple, safe and secure home life, feel as relevant today as when Simmons first shot them. Laurie Simmons has exhibited widely in the United States and Europe. She has had more than a dozen solo exhibitions in New York City. Her work is in the permanent collections of the Metropolitan Museum of Art, the Museum of Modern Art, the Solomon R.Guggenheim Museum, and the Whitney Museum of American Art in New York; the Museum of Contemporary Art in Los Angeles; the Philadelphia Museum of Art; the Corcoran Gallery of Art in Washington DC; the Hara Museum in Tokyo; and the Stedelijk Museum of Modern Art in Amsterdam, among others. In 1997, the Baltimore Museum of Art organized a twenty-year retrospective of her work. Simmons’ work was prominently featured in MOMA’s Open Ends exhibition and in the Whitney Museum’s American Century in 2000. Simmons graduated in 1971 with a BFA from the Tyler School of Art in Philadelphia. She has been a visiting critic in both Columbia and Yale University’s graduate photography departments. She received a National Endowment for the Arts Grant in 1984, a Guggenheim Foundation Fellowship in 1997 and the Roy Lichtenstein Residency in Visual Arts at the American Academy in Rome in 2005. Her film The Music of Regret premiered at the Museum of Modern Art, New York in 2006 and has been screened at the Tate Modern, the Centre Pompidou, The Whitney Museum of American Art, the Hammer Museum, The Walker Art Centre, the Centro Reina Sofia and elsewhere. Simmons was a featured artist in the PBS TV Series Art: 21-Art in the 21st century in 2007. She is represented by Sperone Westwater Gallery in New York. Simmons lives and works in New York City with her husband, the painter Carroll Dunham, and their two daughters. A fully illustrated catalogue raisonné of the early black and white work is available for this exhibition, with 62 duotone reproductions, of which 54 are full page. The book also features a critical essay by Carol Squiers, a leading voice on photography and a curator at the International Center of Photography in New York, as well as an autobiographical account by Laurie Simmons. Laurie Simmons, IN AND AROUND THE HOUSE, hardcover, clothbound, 96 pages, 9 ¾ x 11 ½ “/ 24.5 x 29 cm, ISBN 0-9740666-0-5, $ 39.99. Distributed to the book trade by D.A.P. (USA) and Hatje/Cantz (Europe). Published by Carolina Nitsch Editions.